If I was to compare Illuminus to anyone I would obviously point to Tool, but in some ways, they are so much more, at times reminiscent of The Who, at times that early Killing Joke/early Shihadsound, a kind of powerful stabbing staccato full band attack. Illuminus have supplied a very distinctive EP to arouse your ear lobes, and while there is some surprising variety to the music it keeps to a homemade recipe of heavy grinding guitar licks and riffs contrasted with clear vocal tunes that are slightly muffled and not dominant like your usual made for radio mastering. This unique mix generally places the drums clean and upfront while the guitars are slightly muffled with the vocals set more in the background with its heavy reverb and other effects. The one exception to this formula is the opening track Haven with its clean strummed acoustic guitar backing a very melodically sung megaphone effect vocal tune, providing a stirring intro indeed. From Track 2 the music shifts into another gear with Shards blasting you with a set of metal shearing electric guitars and a very robust rhythm that is potent and uplifting, the song doesn’t just plod along either, with its deft changes and a superb bridge that leads to a very uplifting tuneful finale. Wept 2.0 provides stimulating symphonic flange guitar and string like keys which add another dimension to the dreamy mix very nicely. Each track with its different character and appeal provide you with an array of sensations to translate the meaning and significance of each songs subject matter which is a rare occurrence in a 5 track EP. On repeated listening the power of the melodies and its unique resonance creates a Hymn like after taste, a kind of gospel set over Metal and it's entrancing in a new, but all good way. Explosive, heavy and fast sums up Auckland trio’s Illuminus and their assault of noise that descends as opening track, The Machine erupts into life. What I can tell you by my first listen, is that this is a strong album that deserves a lot of credit, because it’s a brilliant reflection of Illuminus’ sound and doesn’t try to be anything that it isn’t. With my lukewarm reaction to Aidan Dickens’ vocals on Fading By Degrees, I was hesitant venturing back into the territory. But what I found was something a lot more pliable and edgier vocally that inspired and created imagination. Aidan’s vocals are well suited and blend well with the whirlwind of gothic noir inspired elegance, mystery and tempo. For You has a great fade out vocal style, insanely great guitar riffs and creates their very own The Butterfly Effect uniqueness. Elsewhere, Illuminate, a stand out track gently serenades you with a beautiful piano intro; it’s dark, mysterious and everything just falls into place as it should. Rock and Metal go hand in hand with Illuminus and sprinkled with elements of Punk and Thrash makes for a very enjoyable and commendable listen. Every now and then an album comes along that surprises with its’ fresh sound and bold song writing. 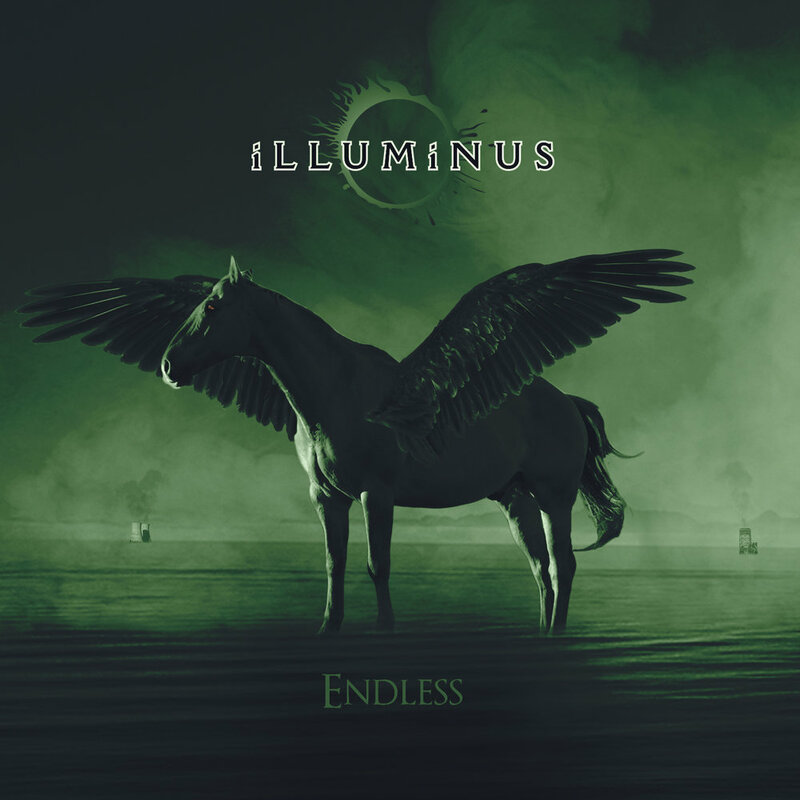 Illuminus’ debut album, Until The End, has been the first such surprise of 2012. The band, led by Aidan Dickens, combine elements not usually found together in rock music to craft an interesting sound that engages you from the get go. Instead of focussing on pounding rhythms, show off guitar riffs and in your face vocals, Illuminus blend pianos, electronic elements and more. The resulting sound means that no one member of the band, or instrument, ever feels like they take centre stage so there’s no detracting from the overall sound. Having seen the band described as heavy rock/metal I was expecting something different to what I got – sure there’s heavy moments, like on Berated, which starts off sounding a little like 90’s Irish rock outfit Therapy? before unleashing some doomy sounding riffs, then pulling it back to a more mellow sound. But overall the sound is quite mellow, with plenty of ballad-like moments; despite the doomy spin put on it there’s a positivity to the sound that’s refreshing to hear. My only problem with the album was with the mix, which occasionally leaves some of the instruments sounding muddy, although that’s possibly due to the MP3 download, rather than the production. Other than that small issue, Until The End is a professional debut from a band that should win fans with their unique sound.